Construction equipment specialist Terex has unveiled its one to five tonne mini crawler excavator range in Australia. 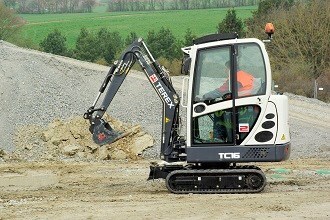 Terex says its new mini excavator range is designed to meet the challenge of working in limited and confined spaces. There are eight models in the range – the rear engine TC15, TC16, TC20, TC29, TC35 and TC48; and the zero tail swing models TC37 and TC50. The zero tail swing models feature a laterally fitted engine with the fuel tank and hydraulic manifold integrated into the rear of the machine. Terex says a key design feature of the new range is the Terex Knickmatik solution that allows the machines to work on sites with very limited space. The technology applies to the centre pivot joint that allows the boom to be moved to either side at full digging depth so operators can work right against walls, hedges or embankments-up to 120 degrees of articulation angle. Other features include an automatic idling system for noise minimisation and economy; adjustable undercarriages on selected models; end position damping for protection and smoother operation; auxiliary hydraulic circuit with load-independent flow distribution (LUDV) function for smooth working manoeuvres without any loss in performance for attachments, and a round contoured dozer blade for optimum material flow. The company adds clever engineering of weight distribution and low centre of gravity makes the zero tail swing machines extremely stable and productive even in limited space. According to Terex distributor CEG Distribution director Craig Doran, the new models are very versatile machines. "Terex minis are not only capable of operating across their entire track width, but also enable lateral parallel boom offset at full digging depth," he says. "Optimised cab ergonomics incorporate high visibility. Some even have two doors, making them unique in their class." He adds the TC37 and TC50 zero-tail swing models are as good as conventional mini excavators when it comes to the digging and lifting forces. "Model TC50 has a turning circle of just 3020 mm and a working range of 6220 mm (even 6405 mm with a long dipperstick), digging depth of 3700/3900 mm, breakout force of 31,200 N and ripping force of 27,000 N," he says. Terex mini and micro excavators are sold and serviced throughout Australia by the CEG Distributions network of Terex Compact Equipment dealers, including ASV Sales & Service. Click here to find Terex excavators for sale. Click here to look up Terex excavator specifications.